The EP Caliber 400 was born to bring the excitement of 3D acro and stunt flight performance together in a compact sized electric heli. The lightweight design starts with the carbon frame and with a scattering of metal parts that contribute to the precision control characteristics; sharp outdoor stunt performance has been achieved. The EP Caliber 400 will surprise intermediate to advanced fliers with its similar flight performance to engine helis. 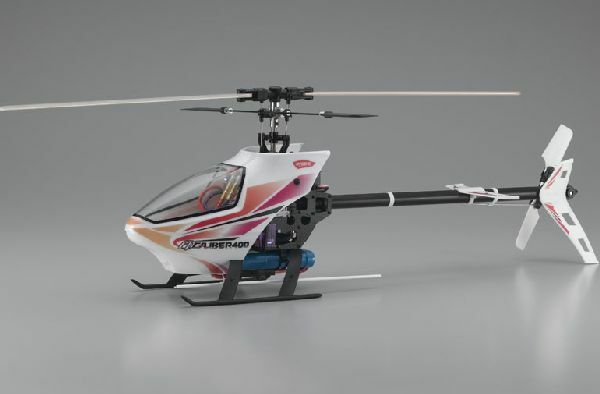 Within its compact frame, the authentic helicopter control mechanisms and R/C system loaded sets a new standard in electric helicopter flight. 1mm thick carbon mainframe results in a strong, rigid but lightweight frame. Loaded with a 380-class motor with enough power for serious stunt flying. Equipped with collective pitch mechanism (variable pitch). Seesaw head with bell-hiller system. Symmetrical rotor blades make high performance stunt and 3D acro flight possible. 2-stage gear reduction transmission allows use of low resistance slim body design. Precision metal parts include 6mm duralumin main mount, hard anodized aluminum center hub and seesaw head. Linkages from the swash plate to the rotor head a pre-set and realize smooth and easy movement. Full ball bearing specifications use a total of 19 bearings. Fixed position of MMS mechanisms on the swash plate results in a simple and effective control system. Belt driven tail rotor produces low drive resistance. Only a short time needed for completion as main components of this semi-assembled kit have already been assembled. Install a brushless motor (planned for future release) for even more 3D acro flight capability.